Emirates is offering another one of its great Flash Sales for travel out of the U.S.! This time you must book by March 19th for travel in most of 2016 and even into 2017. FLASH SALE: Enjoy Special Fares from Select US Cities starting at $659 – 4 Days Only! Savings shall only be applicable to tickets purchased from March 16, 2016 00:01 (EST) through March 19, 2016 23:59 (EST). 2017 through January 31, 2017 only. All travel must be completed by February 7, 2017. Advanced Purchase Required: Seven (7) Days. Minimum stay: Seven (7) days. Maximum stay: Six (6) months. Ticketing time limit is 24 hours. Fares are roundtrip and include all applicable government taxes and fees. Stated price is after discount. Discount is not applied to government taxes or fees or carrier charges and surcharges. Cancellations before or after departure non-refundable. to ?No-shows? before or after departure are non-refundable. No refund on partly-utilized tickets. direction at DXB. Additional stopovers subject to $100 fee per stopover. applicable adult fare. No redemption necessary. Discount fares are subject to limited availability. Fares are subject to terms and conditions as posted. 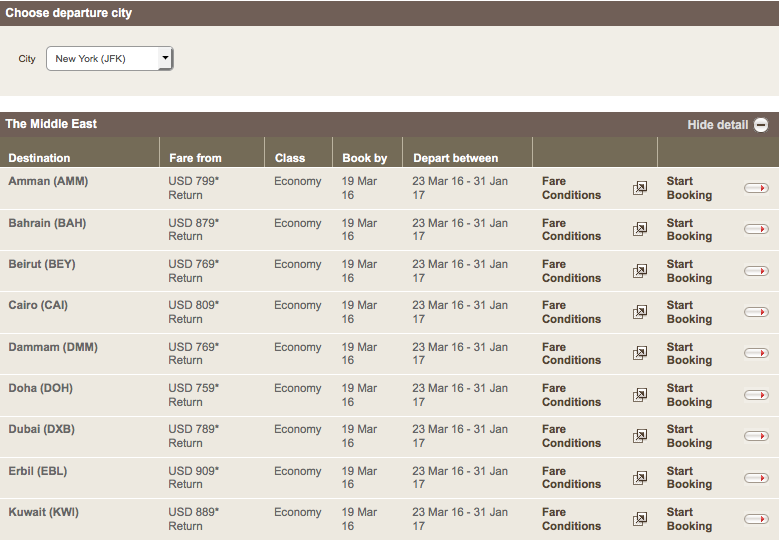 Savings are only applicable to fares that are available at time of booking on www.emirates.com/us.